Rare, iconic mics for the Sphere L22 microphone. The Bill Putnam Mic Collection plug-in, exclusively for UA Audio Interfaces and UAD hardware, adds nine vintage mic emulations — modeled from Bill Putnam Sr.’s renowned collection — to the Townsend Labs Sphere L22 microphone. These mic emulations not only nail the classic timbres of iconic mics used by Bill Putnam to track Ray Charles, Frank Sinatra, and more, they also faithfully model the transient response, harmonics, proximity effect and three-dimensional polar response of the original mics. *The Bill Putnam Microphone Collection plug-in requires the Townsend Labs Sphere L22 microphone. All trademarks are property of their respective owners, and used only to represent the microphones modeled as part of the Bill Putnam Microphone Collection software. Download unprocessed tracks recorded with the Sphere L22, and audition various mic models using the plug‑in. The Mics of Bill Putnam Sr. The Bill Putnam Microphone Collection gives you access to the iconic, multi-dimensional sounds of Bill Putnam's favorite microphones — the same mics used to track Frank Sinatra, Nat King Cole, The Mamas and the Papas, Ray Charles, Elvis Presley, The Beach Boys, and more. Now you can track vocals, guitar, and more through Putnam’s best mics like the Neumann U47, Telefunken Ela M 251E, RCA 44, Sennheiser 405, and more. 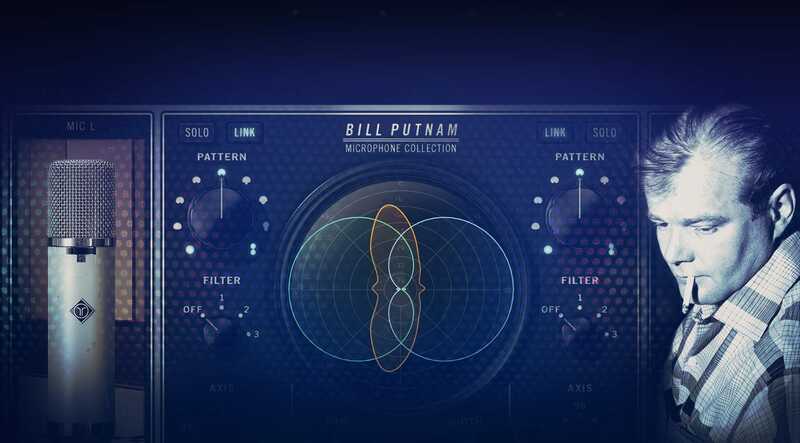 With the Bill Putnam Microphone Collection plug-in, you can change the proximity effect and polar pattern in real time or at mixdown, as well as reduce bleed, room coloration, and feedback — before or after tracking. You can also blend two different mic models together for recordings that capture the characteristics of both microphones. Easily record a singer/guitarist with reduced bleed between the vocals and guitar, or tweak a vocal’s bass response with the adjustable proximity effect. By connecting the Townsend Labs’ Sphere L22 microphone to the mic preamps on a UA audio interface, Sphere allows you to instantly monitor and record with a huge variety of mic sounds in real time. This ultra-low latency recording experience ensures that you can capture the emotion of a performance using the ultimate mic locker. This is a perfect Collection of great sounding microphones for my sphere L22 microphone. It´s very usefull to change the type of microphone after recording to get the best sound u can get. Best Townsend Mic Locker So Far! The BP-251E model is based on a classic Austrian made microphone built for export to the US which has a 6072 tube and an original fully brass capsule. The 251 is one of the rarest and most highly regarded microphones of all time. It is the go to vocal mic for many A-list artists, including Beyoncé. The BP-251A model is based on a classic Austrian made microphone which has an AC701k tube and an original fully brass capsule. Created in 1947, the U 47 has stood the test of time as the ultimate studio mic. The BP-47M model is based on one of Bill Putnam's 47s, with an M7 capsule and features a slightly warmer sound. The 67 is a unique and wonderful mic that tends toward warm, yet without sounding dull. It really shines on distorted guitar amps where it can reduce harshness while maintaining detail. The LD-67 model is based on a mid-1960s version with an EF86 tube. The particular 67 modeled is slightly warmer sounding than other 67s. The high-pass filter and pad switch settings are fully modeled. In many older microphones the pad switch, in addition to lowering gain, can change the frequency response and overall sound considerably. Filter position 1 models the high-pass switch. Position 2 models the pad switch. Position 3 models the case when both high-pass and pad are enabled. The BP-12a model is based on an early '60s C12A microphone, which has been put to good use recording vocals for Geddy Lee, David Bowie and many others. Under the hood the C12A is much like the legendary C12 but with a 7586 nuvistor tube. It still uses the same CK12 capsule which is a big part of the sound. On the outside, the body style changed from the classic C12 cylinder to a variant of the 414. Audibly, the end result of these changes is a little less sparkle and a more warmth than its predecessor. The C-37A was released in 1955 and uses a 6AU6 tube. It's known for a darker sound which can be good for taming sibilance and harsh high-end. The mic has been used by countless artists, including Frank Sinatra. It's also often a good choice for snare or tom miking. The 37 supports non-directional (omni) and uni-directional (cardioid) patterns which are both included in the BP-37A model. On the original the pattern is adjusted by mechanically moving vents on the back of the capsule using a slot on the back of the mic, which is unusual. The mic has a 4-position high-pass filter which is mapped to the plug-in's Filter knob. The M (Music) position is essentially flat and the M1 (Music 1), V1 (Voice 1) and V2 (Voice 2) settings providing progressively more bass attenuation. Some might argue the 405 is a highly underrated microphone. It has been used on countless hit records, including as the overhead drum mics on The Beach Boys' "Good Vibrations." It was one of the first solid state microphones and is also unique in that it uses radio-frequency technology to interface with the capsule. With the BP-405 model, when the pattern control is set to omni then the model is based on the omnidirectional 105 microphone, which is in the same product family as the 405. When set to cardioid the model is based on the 405 which has a native cardioid pattern. Frank Sinatra, Bing Crosby and Elvis Presley. Bill Putnam often used the 44 to record pianos. The BP-44 model is based on a 44BX mic which has a slightly higher output level than previous versions. The original 44 has a fixed figure-8 polar pattern which results in a very warm sound due to the exaggerated proximity effect. To obtain the most accurate modeling set pattern control to figure-8. The 545 is a predecessor to the SM57 which was the first mic to use Unidyne III capsule. The 545 is one of the first handheld end-address dynamic microphones and has a more uniform polar pattern than its predecessors. The 545 was used extensively on Pet Sounds, including Brian Wilson's lead vocal, and countless other recordings of that era. Also, the 545 (and the 565 variant) were used extensively to record performances at Woodstock. This is a perfect Collection of great sounding microphones for my sphere L22 microphone. It´s very usefull to change the type of microphone after recording to get the best sound u can get. Both the original and Ocean Way models are excellent and highly versatile.. but to my ear the Bill Putnam collection goes a bit further. I can't speak to the exact authenticity but I know I love the new mic models I've tried, in particular the Putnam U67. It's a keeper. I thought the ocean way was gonna be more than enough emulations but I am glad I picked this up. The demo shows just how much of a difference there is between some of the classic mics. Now i need to learn them all! I’m not sure if Townsend emulates better microphones lately or if they get better with time at capturing and emulating the essence of these famous microphones but everything sounds better with each new release. I have all three lockers (Townsend Factory Mic Collection, Ocean Way Mic Collection, Bill Putnam Mic Collection). I was excited with the Ocean Way locker but I just bought the Bill Putnam one and it sounds even more incredible. The true star of this locker is the BP-47. It sounds unbelievably amazing. The Townsend LD-47 sounds muddy next to it, and The Ocean Way OW-47 sounds good but still not quite like the Bill Putnam one. As soon as I put the BP-47 on my lead vocals, everything magically opened up, it tamed the chest resonance and the slight nasality that the other two failed at as well as lifted up the high frequencies without harshness or sibilance. I switched back to the other two and suddenly it felt like “the picture was out of focus again”. Or “going from HD definition to VHS definition”. Also, the BP-47 sound is 3D-like compared to the other two. I’m trying not to write a novel here, so I’ll be brief with the rest. The 67 was equal to the Townsend 67 NOS one, although slightly brighter. Between the three lockers, I found that the version of the famous C12 from Ocean Way sounded best. Keep in mind that I tried them only on vocals, so it might not apply for other instruments, and actually depending on the vocal characteristics as well. I liked both 251 from the BP Collection, the 251E being slightly warmer than the 251A, they are still both better than the Townsend 251 but not by a lot. The 37A sounds amazing as well. Nothing to compare there as this model is only in the newly released Bill Putnam Collection. If you can only afford one locker, I would recommend the Bill Putnam one. Es un placer disponer de este armario de micrófonos. OK, I can't be impartial. That's my daughter Hannah's voice on these Putnam mic "models." Truth is, to have our name in any way associated with Bill Putnam is an honor. While in LA, I often worked at Capitol, and a couple other studios that owned Putnam originals. They sounded awesome. These models bring back lots of good memories. The mic collection that comes with the Sphere mic is terrific. Having more "flavors", especially when derived from mics treasured by so many, as is this Putnam "Collection" is the icing on the cake! I have all the Townsend Mic Collections and this one is my favorite. Its’s also nice that the original Mic Collection is included with this collection. I am so amazed at what you can accomplish with this Mic and plugin that cannot be done with a conventional Mic. This technology is definitely a game changer. I have unlimited tweets but getting back to the Mics from my experience and listening to the experience of others that have some of the Mic modeled here the emulations do sound like the Mic they mimic. If you have to choose only one locker I would recommend starting with this one first. This collection is fantastic for any studio owner - the RCA44 is absolutely insane. I definitely think it's worth the additional purchase and encourage people to scroll through while the singer is setting up and commit the sound, just as they would if they owned these mics. I felt this collection was slightly more to my tastes than the sphere l22 180 software that came as a throw in offered - is it better than ocean way ? Is it different ? I use this mainly for voice over. I have the other Townsend collections and this I think is my favorite...for VO anyways. The senny 405 and AKG sound superb for low male voice. Love it. Best pack yet IMHO. I feel like I’m in the room with Nat and Frank - and they’re letting me use their mics for fun. Just gorgeous - we’ll done, UAD and Townsend Labs for the L22!! I love that you guys are doing more mics, and I freaking love my Sphere mic. It's the last mic I hope to buy (but who are we kidding?). I get that it's not free to access these classic mics and to put people's names on these collections. But $249 for what is essentially a preset pack seems a bit steep. I hope these kinds of things will go on sale early and often. Let's just leave it at that. Love you, UA, keep up the good work. I'm not going to ding something with less than a five star rating, without hearing it. I'm sure it sounds great. Amazing realism and so many choices! This is a fantastic collection.